Hyperparasitoids of mostly Ichneumonidae (Hymenoptera) and Tachinidae (Diptera) parasitizing Lepidoptera caterpillars and social wasps. Additionally Taeniogonalos have been reared directly from sawfly hosts (Symphyta) in Australia. Thousands of tough, minute eggs are laid on leaves, which are then eaten by caterpillars. The trigonalid larvae hatch inside the caterpillar and either consume any parasitoid larvae that are already there or wait until the caterpillar is parasitized and then consume the parasitoid without eating the primary host. Benoit, P.L.G. 1951. La systematique des Trigonalidae (Hym.) ethiopiens. Revue de Zoologie et de Botanique Africaines 44: 141-147. Carmean, D. & Kimsey, L. 1998. 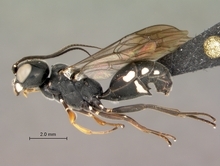 Phylogenetic revision of the parasitoid wasp family Trigonalidae (Hymenoptera). Systematic Entomology 23: 35-76. Weinsten, P. & Austin, A.D. 1991. The host relationships of trigonalyid wasps (Hymenoptera: Trigonalyidae), with a review of their biology and catalogue to world species. Journal of Natural History 25: 399-433.